Let’s just say that I’ve been featuring some of my idols this weekend. Remember, I have so many and I do apologize…I can’t get to everyone 🙂 I find something unique in everything I view. I just had some extra time this weekend due to not having to work, so I thought I would play a lot. Another idol is Lauren Meader. I have been a long time follower of her work from way back. I love her style and how she comes up with the most awesome stuff. I also admire her from a mothering point of view….she is amazing! 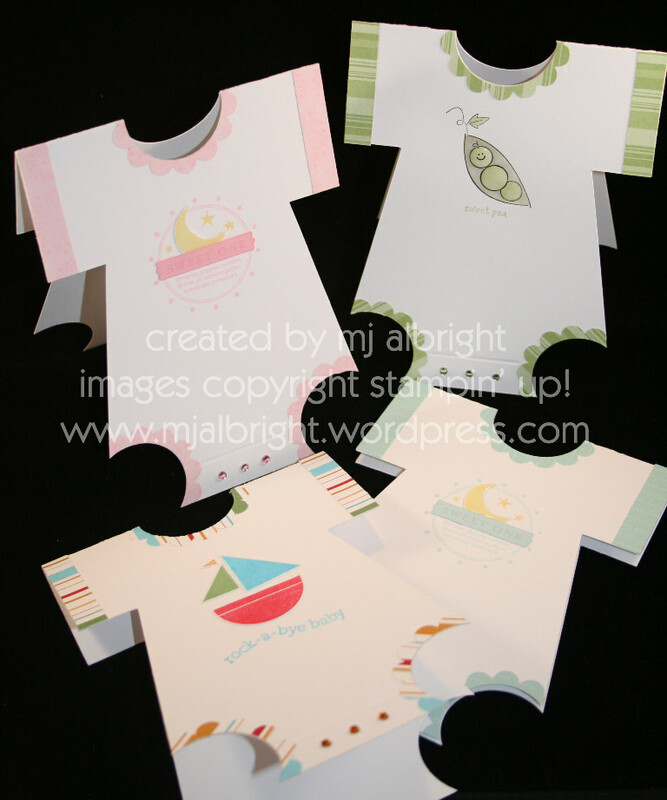 On Lauren’s blog this week, she showcased the cutest onesie cards that you can view here. She didn’t stop there. She made a onesie bouquet for her friend who just delivered a baby girl. My mouth dropped. I had to try the onesie cards… I won’t even attempt the bouquet this weekend. I am forever running to the store to buy a baby card (usually on the way to the shower or to see the new arrival…I’m so bad). My friends baby shower is in mid February with a green Sweet Pea theme. So I cut and mounted the retired hostess SU! set Event Full because it had a cute sweet pea image. CARDSTOCK USED: Papertrey White CS, Soft Sky and Certainly Celery Prints DSP, East Coast Prep DSP, Berry Bliss DSP, Soft Sky and Pretty in Pink CS. INKS USED: Stazon Jet Black, Mellow Moss, Certainly Celery, Pretty in Pink, Barely Banana, Soft Sky, Real Red, Wild Wasabi, Tempting Turquoise, More Mustard. ACCESSORIES USED: Scor-Pal, 1-3/8″ Circle Punch, Scallop Punch, Crystal Effects (to peas and moons), Rhinestone stickers. Happy Sunday! And may the better team win. Oh my gosh…these are totally adorable MJ! Love them! These cards are super cute…I’ll bet the new mommies are gonna love them!!! These are so so cute! I am so going to try these! So many possibilities!! BTW, thanks so much for the bday card! It was awesome! Do you mind if I show it on my blog? shut up!!!!!!!!!!!!!!!!! these are so cool!! These are just adorable, Mary Jo! Too, too cute! MJ, those turned out incredible! One is prettier then the next. 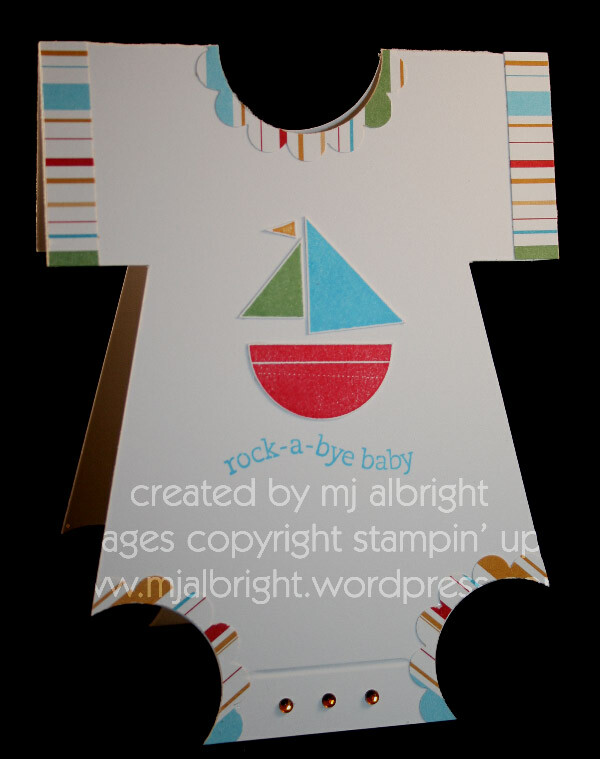 Awww… makes me wanna have another baby just so you can make me one of these adorable cards, MJ! Dang ol’ vasectomy! Mary Jo–I love your work! It’s nice to know you’re looking up to someone while I’m looking up to you! These are the cutest Onsie cards I’ve seen thus far!! The stamp sets you used are perfect for them. Please, can you share the template? I would love to make these as thank you cards for the new mom to be! TIAFS. TOO CUTE!!!! and checked out Lauren’s blog, amazing stuff! I love your style! Very Inspiring! What darling cards these are!!! Usually when I make one card I stop – but you made a bunch – how fun is that!! Thanks for stopping by my site – love yours too!! I am lovin’ these!!!!! I’ve seen several idea’s come close but not nearly as cute as these. I’m totally copying!!!!!! Thanks!! I loooove the onesie cards! I seem to be at a time in my life where EVERYONE is having a baby (I just had one too – he’s nearly 6 months old!). I gave it a go, trying to make my own onesie card, but I COULD NOT get the circle punch through 2 layers of card stock at the top fold! Did you have trouble with this? Any hints? I wonder if it was because I tried SU! Naturals White instead of Whisper White, and I know the Naturals is a little heavier weight. I’d love to have more explicit directions for these (like how to get the leg holes similarly placed!). Thanks so much for sharing! Love your blog! What Beautiful work…..as Always!!! Love this. MJ these all came out so cute. Love each and every one! They sure are adorable ! WOW!! These are sooo adorable, Mary Jo!! I love how you used the scallop punch to accent the arm and leg openings! And the cute little rhinestones as the bottom buttons… so clever! YOU ROCK! These are just adorable. I love the colors you used! Thanks for sharing the link for the tutorial! Those are cute little cards! I have been making onesie cards for about two years with my local scrapbook Accucut die. Used teddy bears and flowers in the center…hadn’t thought of the sweet pea or boat. Cool idea!